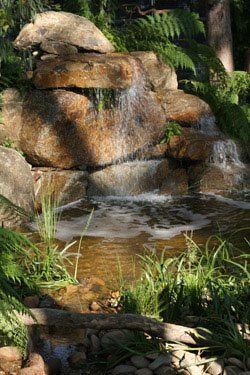 If you a trying to create a natural look in the garden, then a stone water features or waterfall could be the perfect addition. 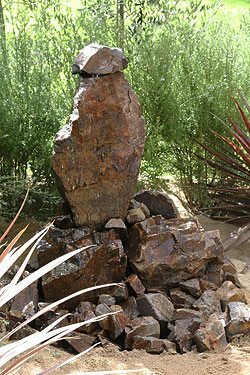 Rock and stone has been incorporated into gardens for many years. Natural stone, artificial or ‘fake’ rocks and reconstituted rock and stone are widely used to create both natural looking pools and water falls as well as contemporary looking designs. In general these water features are constructed from three different materials. Real rocks which are usually the most expensive. Stacked stone, often seen in water walls. Although natural rock is the most expensive to build with, it does have benefits of providing a realistic look and a long lasting result. Fake or imitation materials have the advantage of being light, easy to work with and cheaper. With advances in manufacturing this is now a real alternative. The waterfall (pictured right) was installed at the Melbourne International Flower and Garden Show. Large rocks such as those used in this design will require specialist lifting equipment, and will become a permanent feature. With the right pump, water is easily recycled through the system and a pool can be created to fit in with other landscaping aspects. We also have simple stone bowls and troughs that are often found in Japanese and Balinese style gardens. So the use of these materials can help create any manor of effects in the created landscape, the use of water, stone and rock is only limited by the imagination, and of course the budget. One of the newer products on the market is artificial stone. Often make of reconstituted rock and moulded into either preformed rock pools, or increasingly moulded into individual rocks that are natural looking. The advantage is the cost and ease of installation. Weighing a fraction of the cost of real stone, they can be installed without the need for heavy equipment. Usually made from Fibre Glass Reinforced Concrete these are probably the future of lightweight rock water features. However if you are looking for a natural rock look, at present many are simply just not ‘natural enough’ for our liking, although they are getting better every year. Stacked stone, similar to that used in stone cladding is widely used in as an alternative, tending to a more modern or contemporary look.